tl;dr: Corinna is an ex developer, ex UX designer, ex Scrum master, ex product owner and ex agile coach from Germany. She works at sipgate. 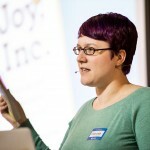 She spends most of her time thinking and writing about agile, lean and related stuff. Sometimes she talks about it at conferences. She’s best known as the creator of Retromat and would like to also be known for Wall-Skills and 24 Work Hacks. I always read the “About”-page in blogs, too! So, what would I want to know? Way back I worked as a web developer and Flash programmer. When I had learned most of the field I went to university and now hold the equivalent of a master’s degree in computer science. CS was a blast and I tried many different areas. My specialty is usability and user experience (UX). My agile journey started in 2010, when my employer sipgate (a telco with 120 employees) started doing Scrum. I was in the first Scrum team (Team Princess FTW!). Soon afterwards I became Scrum master for 2 teams. We tried a bunch of stuff and later I was member of a Kanban team (the UX team) and something akin to a Scrum master for another Kanban team. My journey took me from Agile to Lean, Systems Thinking and Communication. In 2012 I tried on enterprise shoes and worked for a FTSE 100 company. Afterwards I was disillusioned and did a self-financed 5 months Sabbatical to regroup. I decided to return to my former employer as a web developer. This was an excellent decisions. It’s such a great place to work, we even wrote a book about it. In my spare time I work on Retromat and summarize stuff for Wall-Skills. Next to me on the couch sits the awesome Tobias and since October 2014 our amazing daughter Brienne. You can reach me at corinna@finding-marbles.com. The blog’s name is a reference to “to lose one’s marbles”. I spot and help fix broken processes in companies and mend relationships between people – Not lose marbles, but find them. Thank you for mention us in your BoardAvatars! We want to give to you and your readers a little gift: LPH1382D. Everybody can use this code to get 15% discount for ordering ScrumMagnets. Would you like me to add that on the Board-Avatar page? Hi Corinna, thank you so much for sharing all your valuable experiences openly! I found your retromat and your blog yesterday and I’m really excited to get such really helpful support for designing my future retrospectives! Thank you!